New legislation in Indiana will soon make it easier for schools to access funding to improve their security measures. In a special session held on May 14, 2018, the Indiana General Assembly passed House Bill (HB) 1230 to increase the funding available through matching grants and low-interest loans to schools for improved security. HB 1230 significantly increased the budget for the Indiana Secured School Fund, which was established in 2013, from $9 million to $14 million annually. School corporations and charter schools with more than 1,000 students are eligible to receive up to $50,000 per year, and those with fewer students may apply for up to $35,000 each year. These funds are matching grants, meaning that they do not have to be repaid. While school corporations and charter schools do have to match dollar-for-dollar the same amount of funding they receive, matching grants such as these can significantly stretch a school’s existing funds. In addition, schools may apply for these funds every year, which will help those with a more limited budget spread out the costs of improving their security over a longer period. The Common School Fund is awarded as a low-interest loan from the state that the school can re-pay over 10 years. The maximum amount a school corporation or charter school can receive is $500,000. The Indiana Secured School Fund is a competitive program. So, not every school corporation and charter school that applies will receive funding. However, those that don't receive grant funding can still apply for low-interest loans from the state's Common School Fund. And, those that do receive a grant can also apply for a loan if they want to spend more than what they are awarded through the Indiana Secured School Fund. The additional funding behind the Secured School Fund and the Common School Fund puts better security within reach of more Indiana schools than ever. Now the question is, what kind of security measures do our schools need? Based on the most current data available from the National Center for Education Statistics (NCES) (Figure 1), controlled access to buildings during school hours, also known as the "lock-down" model is clearly the most common type of security measure in place in public schools today. The popularity of the lock-down model makes sense – it is easy to implement and is a relatively inexpensive way to control entry into the school. However, the lock-down model may not provide as much security as we would like to think it does. 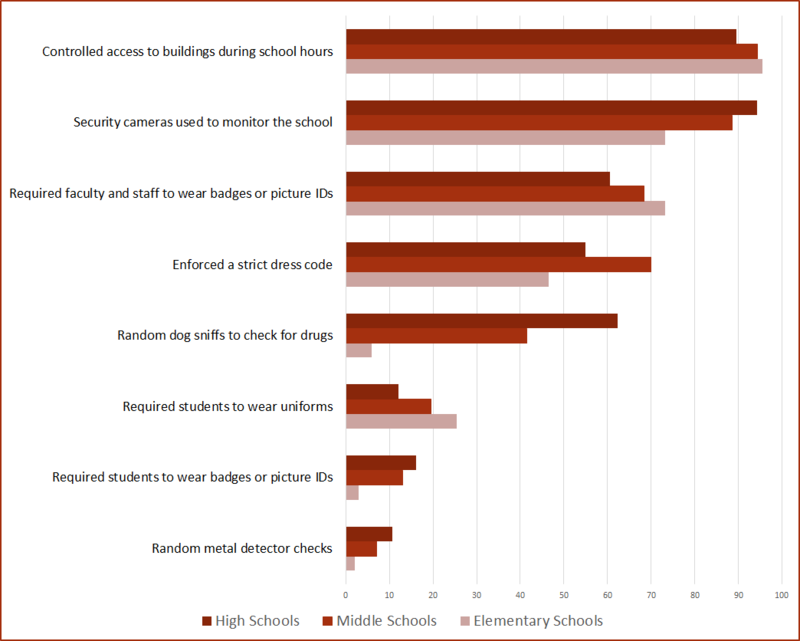 Figure 1: Percentage of Public Schools that Used Selected Safety and Security Measures During the 2013-14 Academic Year. With a lock-down model, people have to enter the school through a front door and are funneled through a single point of entry into an administration area. In many schools, the inner vestibule doors are often locked, which does add an additional layer of security. However, according to Bryan Smith, Koorsen Fire & Security's Director of Security, whether or not a school has access control or emergency response features built into their entry system remains hit or miss. "And, even with a lock-down model that funnels an intruder into an administration area, once that intruder is in the building, it can be all too easy to gain control at that point and to get further into the school," Smith said. Cameras are also a popular security measure in schools because they allow school administrators to investigate unwitnessed incidents in corridors and other areas. However, it’s important to remember that the value of cameras in keeping schools secure is very limited if there's no one available to monitor them. Who is Watching Out for our Children? In recent years, school resource officers (SROs) have become a common fixture in many schools across the country, serving to educate and motivate students, in addition to watching out for their security. SROs are typically sworn law enforcement officers, assigned by the police departments or agencies with whom they are employed to work, in collaboration with one or more schools. The National Association of School Resource Officers (NASRO) recommends that SROs should also have at least 40 hours of specialized training in school policing in addition to community policing experience before being assigned. In Indiana, SROs are required by law to have training in the skills, tactics, and strategies necessary to "address the special nature of school campuses" as well as "school building security needs and characteristics". Now, thanks to HB 1230, in order to be certified, SROs must also have more specific training in identifying, preventing, and intervening in actions by a person who is present on school property with the intent to harm another person. The NCES analysis of school security measures did not include the number of schools with SROs. However, in a more recent report, the agency estimated that, throughout the United States, only 42 percent of public schools surveyed reported having at least one SRO at the school for at least one day a week during the 2015-2016 academic year. School resource officers (SROs) play a vital role in school security. However, it’s important to remember that they cannot be in all places at all times. The best security system is one that includes SROs and provides them with technology that extends their ability to keep students safe. In light of recent school shootings, the paradigm of what it means to be a secure school is shifting. School administrators now know that having a lock-down model with security cameras and an SRO onsite to monitor them may no longer be enough to keep our kids safe. While all three are undoubtedly important components of school security, their effectiveness can be significantly enhanced with the right kind of technology. Smith said strategic intrusion detection systems or access control systems such as these can also be connected to a central control station, in which a campus police department, security specialist, or an SRO can be monitoring the school live on cameras. When an alarm or door locks are triggered, the person monitoring the camera feed can see the event on the screen and associate that with a specific location in the school. This type of system can give security personnel eyes on the entire campus without having to get out of their chairs. These systems can also be designed to employ a threat escalation model that triggers progressively stronger security measures as the threat escalates. For example, at the first stage, when an incident occurs at an individual school, the system would notify all personnel making them aware of the threat so they can take action proactively. Initially, they might go into a lock-out phase where all exterior doors are locked and credentials allowing entry would be disabled. A second level might be a full lock-down event that would not only automatically lock the exterior doors but also the interior doors. "The nice thing about this is that you don't have to think about it," Smith said. "It happens automatically at the press of a button." That's one of the biggest benefits of technology, Smith said. Properly designed, a security system can automatically notify first responders, which will get them on the scene faster. "It gets that first communication out much more quickly than someone trying to react in the moment, looking for their phone and potentially dialing 911. It's an automatic process. When someone sees a problem, they can activate the system through an app, software, or the press of a button." Recent events in which active shooters used fire alarms to gain access to students has prompted school administrators to look for solutions that balance the need for students and staff to get out of the building in the event of a fire with the need to keep intruders from coming in. Fortunately, HB 1230 helps to strike that balance by adding a provision for a school employee to barricade or block an exit in the event of an unplanned fire alarm for up to three minutes – just enough time for a designated school official to determine if the fire is real. In the event that an active shooter has been verified to be on the school property, the exits may continue to be blocked to keep the students inside the building if that's the safest option based on where the intruder is located. Smith said that technology is available to make sure these requirements are met, "We can design a system that can effectively override the emergency release of the door locks from a fire alarm and put the school into a lock-down scenario." Smith noted that this type of system would require special approval from the local fire marshal. He emphasized the importance of working with a consultant that has expertise in both fire safety and security to ensure the resulting system will provide the desired security while still keeping students and school employees safe in the event of a fire. "When it comes to emergency response,” Smith said, “there's no cookie-cutter solution.” He explained that when designing a school security system, “there are always a number of factors at play, including the types of administrative controls that a school might already have in place as well as the physical architecture of the building. And of course, you also have to consider a school's goals and its budget, too." Smith said the good news is that with proper planning and guidance, combined with the additional funding made available with the passage of HB 1230, schools with even modest budgets can now put a system in today and successively scale it up to become a full, state-of-the-art system in just a few years. HB 1230 will go into effect on July 1, 2018. Smith said that while this doesn't allow much time to get a system in place for the 2018-19 school year, most of the technology now available would create minimal disturbance even if it has to be installed during the school year. He recommended that schools interested in getting a jump start on improving their security should begin planning now. "These funds are available year after year," Smith said, "so if you're just getting started, it's important to get a plan in place now that will allow you to build as you go." If you're ready to make your school more secure, Koorsen Fire and Security is here to help. Our security experts will meet with you at your school to get a thorough understanding of your current situation and will provide scalable solutions to help you meet your goals and to take advantage of the funding available through Indiana’s expanded state programs. Contact Koorsen today!